Media release from Spain: The XXI edition of the World Transplant Games, which will be held from 25th June to 2nd July, has its own official video and hymn. 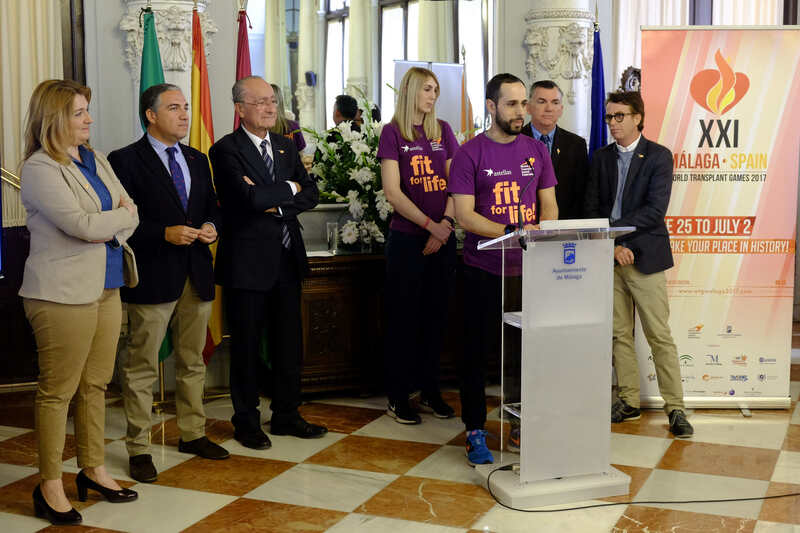 The Mayor of Malaga, Mr Francisco de la Torre, and the president of the World Transplant Games Federation, Mr Chris Thomas, have introduced them today to the media. This presentation has been done after the meeting held between the organisers and the WTGF, in which they have been working on all issues related to this event, which will take place in only 100 days. After visiting the different venues where competitions will take place, Mr Thomas has held a meeting with the Mayor of Malaga, Mr Francisco de la Torre, the president of the provincial government of Malaga, Mr Elias Bendodo and the representative of the Andalusian government in Malaga, Mrs Ana Isabel González de la Torre. The hymn has been composed by Javier Ojeda, a well-known singer from Malaga. With a base of Latin rhythms, the hymn has a memorable melody with lyrics in two languages, English and Spanish. As for the video, it has a strong emotional purpose and also aims at raising awareness about organ donation. Several transplanted athletes from all over Spain talk about their experience and the new opportunities and dreams that can come true thanks to organ donation. The act started paying tribute to Pablo Raez, who was not only a guardian for these Games but also a model for social action and a person who made a great contribution to raise awareness about bone marrow donation. Javier Ojeda, the composer of the hymn, and some of the transplanted athletes appearing in the official video were also present at this presentation. 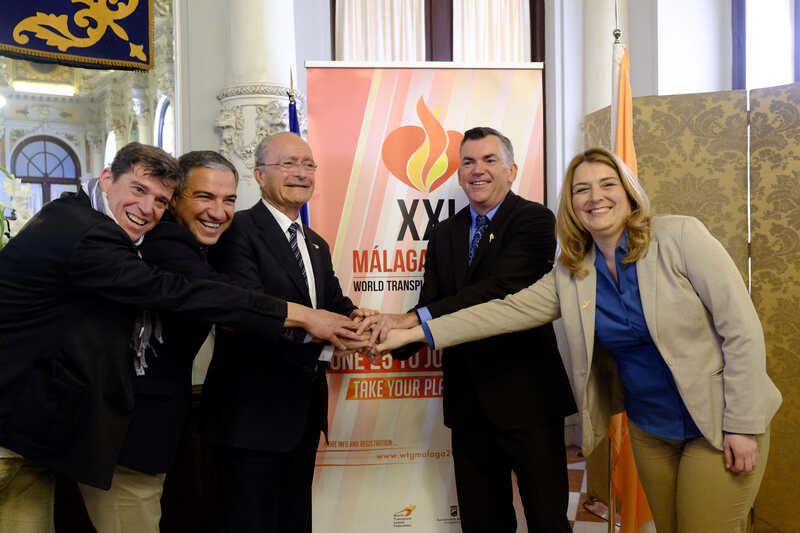 The World Transplant Games in Malaga will gather around 2,500 participants. As for disciplines, this edition of the Games will include 17 sports disciplines. Two of them, paddle and kayak, are the new contributions of Malaga as the host city of the event. Furthermore, up to 10 different venues will host the competitions of the several disciplines, such as golf, basketball, athletics, lawn bowling, table tennis, tennis, squash, volleyball, cycling, badminton, bowling, kayak, darts, swimming, paddle, virtual triathlon and urban race. This XXI edition hosted by the city of Malaga has already received more than 2,000 registrations from many different countries, such as the United States, South Africa, Australia, Canada, Great Britain, Germany, France, Finland, Hungary, Hong Kong, Iran, Ireland, Italy or the Netherlands. In many cases, the number of participants from some of these countries is higher than the one for the Spanish team. Smaller representations are also coming from Austria, Belgium, Brazil, Chile, Colombia, New Zealand, Poland, Portugal, Switzerland, Algeria, Denmark, Israel, Japan, Mexico, Norway, Uruguay or the Czech Republic. Participants can still join the Games, as registration is open until 16th April. This edition will be primarily known for being the first one where both transplanted athletes and donors can join in, giving us the opportunity to discover many stories of self-improvement from two different points of view. The World Transplant Games, organised by the City of Malaga and with the support of the regional government of Andalusia and the provincial government of Malaga, is a worldwide event that is held every two years. The importance of such an initiative not only lies in being a place where sport helps to foster integration but also in being an event that wants to raise awareness about organ donation. The first World Transplant Games were held in Portsmouth (in the United Kingdom), welcoming teams from France, Germany, Greece and the United States only. Any person between 4 and 80 who has received a transplant or that has been a donor and who is in good health condition can participate in the Games, which will include competitions in 17 different sports disciplines. Hosting these games in Malaga is also a fantastic opportunity for Spain, as this country is the world leader in organ transplants.